Offering beautiful views of the Red Sea, a private white-sand beach, sky blue infinity pools and luxuriant gardens with palm-lined deserts and mountains in the backdrop - Baron Palace Sahl Hasheesh is simply breathtaking. 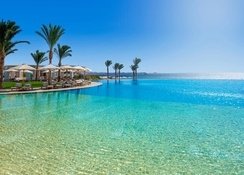 Located in the heart of Sahl Hasheesh Bay in Egypt, this Mediterranean-styled hotel is a haven of luxury. 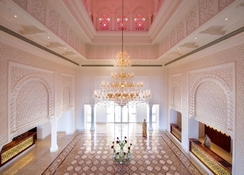 The guestrooms, built in the style of Arabic palaces, serve up views across the Red Sea or the courtyard. There’s a selection of six restaurants and six lounges/bars offering Italian, Middle Eastern, Japanese, Mexican, Asian and international cuisines, plus a sushi bar, barbecue and live cooking events. Boasting royal suites with private swimming pools, a kids pool, water park, pool bars, Jacuzzi, spa and wellness centre, entertainment park, diving centre, playground with sports facilities, shopping mall and daily entertainment, Baron Palace Sahl Hasheesh Hurghada is a beautiful choice for a luxury getaway. Whether you want to lounge on the private sandy beach or enjoy the world-famous diving, you'll never be short of activities and sunshine! The hotel is located in the heart of Sahl Hasheesh Bay, right on the beach. At the front of the hotel lies 600 metres of private white sands. Surrounded by gardens and a variety of swimming pools, the property is designed to resemble an oasis in the middle of the desert; undulating sands and desert lie behind the hotel. Baron Palace Sahl Hasheesh is only 17km away from Hurghada International Airport and 20km away from Hurghada downtown. Cairo is also a short flight away (under one hour) and the hotel provides airport transfer service and shuttle buses the city centre. The 644 rooms and suites at Baron Palace Sahl Hasheesh are categorised into Baron Club sea view rooms, swim-up suites with a private pool, panorama suites, ambassador suites and royal suites. They offer stunning views of the Red Sea and/or the courtyards. The guestrooms feature king-sized bed or twin beds, various types of pillows upon request, balcony/terrace, air conditioning, vanity table, daily stocked minibar, telephones, LCD TV, high-speed internet access, tea and coffee making facilities, radio with individual wake-up clock, bathroom with bathtub/shower stall, 24-hour room service. There are also separate rooms for disabled travellers. All Suites, Baron Club sea view rooms and swim-up suites enjoy the privileges of the Baron Club, with its exclusive access to the spacious Club Lounge. 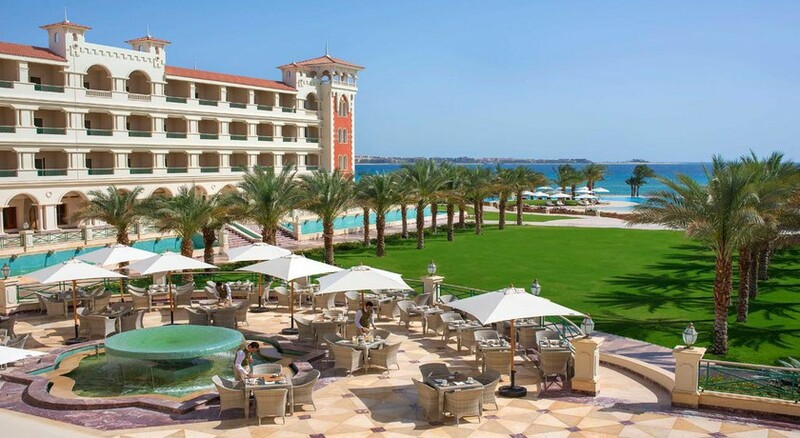 Baron Palace Sahl Hasheesh offers buffet and a la carte menus. There are six restaurants that feature a variety of cuisines and daily changing themed dinners. The restaurants comprise Red Sea Restaurant (international buffet), Bella Vista Restaurant and lounge (Italian), Egyptian Restaurant (Middle Eastern), Chillitos Restaurant (Mexican), Ying & Yang Restaurant (Asian fusion), Mikado Restaurant (Japanese), Infinity Pool Restaurant (seafood with barbecue). All the restaurants have indoor and alfresco seating. There are six bars and lounges within the hotel complex that serves local and imported alcoholic and non-alcoholic drinks. Choose from the Palace Lobby Lounge, Infinity Pool Bar and Lounge, La Salsa Bar and Club, Bella Vista Italian Lounge, Baron Club Lounge, The Niche Bar and Teens Bar. The Infinity Pool Bar and Lounge is located poolside, The Niche Bar is a classical English bar offering exclusive cocktails and premium Cuban cigars. On the other hand, Teens Bar is specially designed to host youngsters below 17 years old. There is a variety of swimming pools including a main pool, cascade pool, relaxation pool, whirlpool with jets (adults only) and honeymoon suites pools (adults only). The on-site PADI-certified dive centre offers a wide range of activities customized for all ages including diving courses for beginners. There’s a fitness centre with a fully-equipped indoor gym, exercise studios and personal trainers. Other sports and outdoor facilities include tennis courts, beach volleyball, aerobics, beach games, table tennis, pool table, darts and a private jogging and cycling track on the promenade between the hotel and the beach. Golf lovers can tee off at an 18-hole golf course near the hotel. Inside the hotel lobby there is a bookshop, jewellery shop and a fashion store, plus a shopping mall within the premises. The on-site spa and wellness centre provides Turkish hammam, sauna, whirlpool, a variety of showers (tropical, hot, cold and jet), outdoor spa pool and massages (hot stone, Thai, Balinese, Shiatsu and more). There’s a separate honeymooners’ spa suite with a treatment area, sauna, whirlpool, rain shower, steam bath and bathroom. The Baron Kids Club has amenities for the tiny tots, such as kids’ playground, entertainment park, kids’ swimming pool (heated in winter), water park, indoor activity room and cinema room. 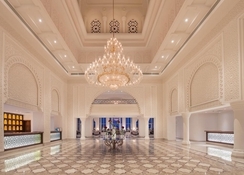 The hotel also hosts evening shows and live entertainment in different venues daily suited for all age groups. The Baron Palace Hotel certainly lives up to its name as we were treated like royalty by all the staff. The food was amazing. A La Carte restaurants were excellent, especially the Italian and Infinity. Even the Buffet restaurant had a vast selection of quality food. Overall cleanliness was excellent. I cannot praise the staff highly enough. They just could not do enough for you always with a smile. We could not even put out our towels by the pool. They would insist on doing it for you and your drinks would be remembered and brought to you all day. We usually like to go somewhere different every year, but this is one place we would certainly return to again and again. Wonderful.